The Ajanta Caves were lost to the world for almost 1500 years . Hidden behind the Western Ghat jungles of India, only the monkeys could call these breathtaking massive carved ancient caves their home. One fine day, about 200 years ago, a hunting of a tiger took place in these parts, with the British hunting party and a certain John Smith at the head. They were feverishly pursuing the great Indian wild cat, going deeper into uncharted ground, past a thick growth of plants. At this point it must have happened! 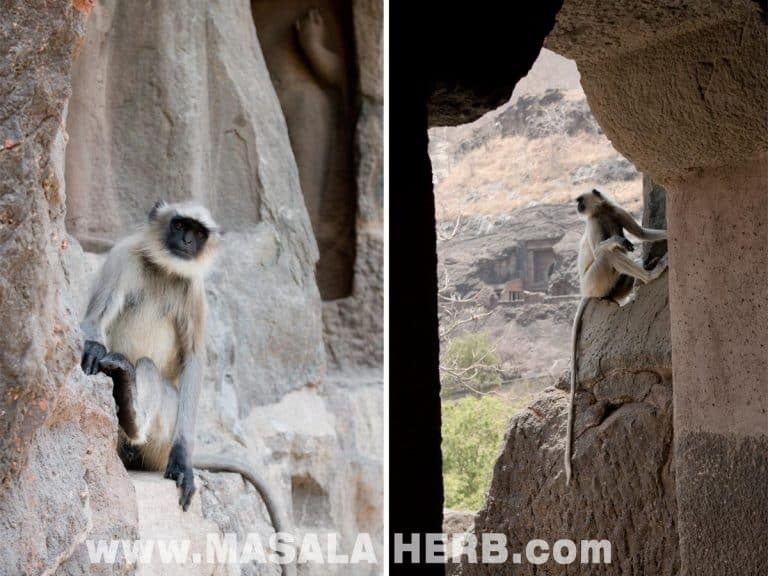 They reached a cliff point and sighted from afar something incredible, a secrete place, the lost caves of Ajanta. When the British discovered, behind a thick jungle growth, about 30 men carved massive cave halls, which were adorned and decorated with precious fine art painting and perfectly carved stone figures, they must have been thrilled by their amazing discovery of the century. Soon the British organized archaeological excavations to the Ajanta caves, and travelers from all over the world have been flocking to the unique sight ever since. In these parts of the Indian region of Maharashtra, various more caves made the district of Aurangabad richer, Ellora caves being the largest and best known in the history of men. There are other caves, which are smaller in size, such as the Buddha caves near Aurangabad. Ajanta is special due to the fact that the caves had been lost for a long time to humankind, and had been rediscovered only recently. 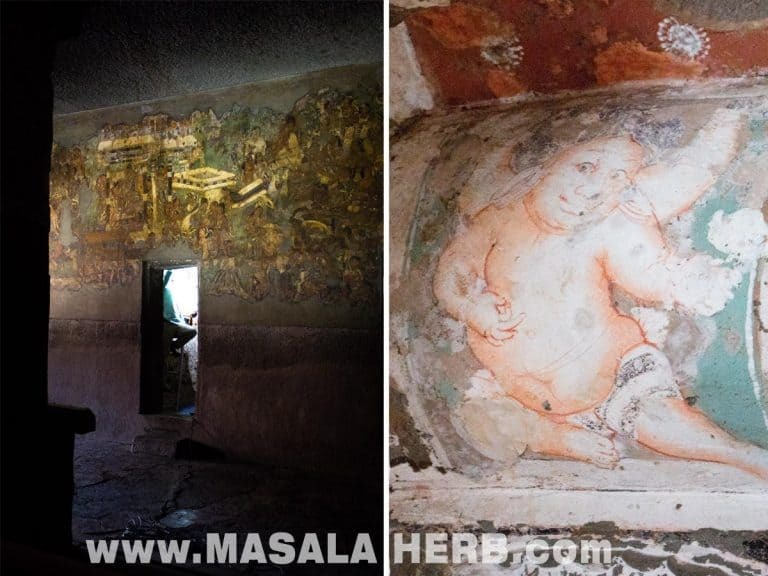 Also the paintings are still looking fresh, bright colors popping out of the wall telling the stories of long dead people, and this increases the priceless value of the ajanta caves all the more. The Ajanta cave complex consists purely of carved out Buddhist caves, and the inner cave hall walls were decorated with paintings by Buddhist monks, in the time from 200 B.C.E to 650 C.E.. 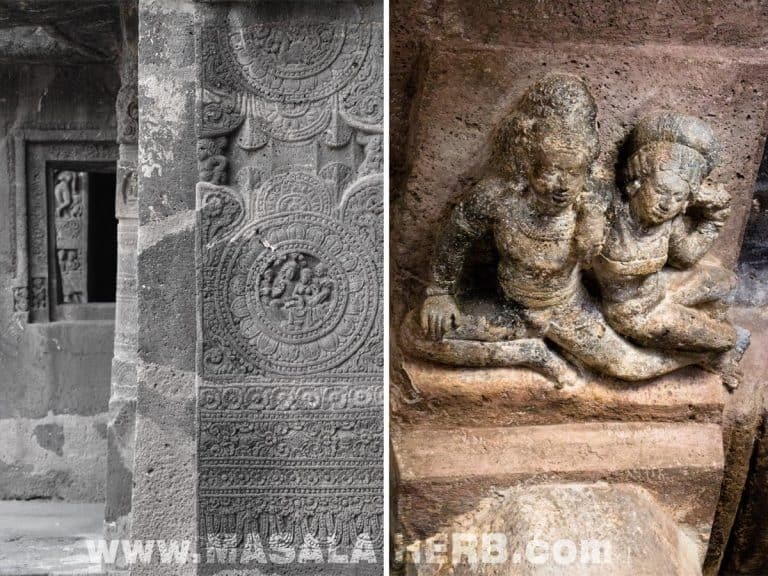 Most of the hall carvings and paintings were created over a span of hundreds of years the oldest being 2000 years old, while the statues were added only 600 years later. and an equal layer of lime juice over all that, so that the paint would hold longer. The color pigmentation used in the Ajanta caves is of an organic nature, and 6 color shades where available to the artists. The fine art paintings are of great detail and finess, which is an indication of various thin color layers, which were carefully dried, and used to create such perfect looking depictions, which still seem to speak to us from the ghosts of the past. Skilled Buddhist monks of the time were the creators of the Buddhist religious art master pieces in the Ajanta caves, situated about 2 hours from Aurangabad city (~100 kms). It is believed by the Archaeological survey of India that the monks where not allowed (and couldn’t) move out during the torrential monsoon rains, so the monks would carve out massive cave halls and conceive monastery residence halls and sanctuary halls out of the volcanic basalt rock of the Deccan plateau. Their imaginations was obviously boundless! None of the lost and found caves are the same, they all are differently decorated! When you enter some of the caves, you get into a huge massive very dark cave hall and each step will enthrall you deeper into the mystery of these caves. Straight in front of you, you will see a great, perfect looking, Buddha statue, either in meditation or praying position and whilst you get closer to the walls you will discover animal painting and faces of people long gone. Each seems to be telling a story and I can guarantee you, that you wished you would now each single one of them. Other caves have huge carved out pillars and smaller adjoining caves at the side of the big hall. Some caves at Ajanta do not honor a Buddha but instead pay respect to a Stupa (meaning a heap in Sanskrit), which is a dome shaped stone carved structure. Each cave at Ajanta is numbered and each had some kind of purpose and message. Cave 26 has a large dead Buddha or sleeping Buddha carved out on the left wall, with, what seems to be smaller humans, mourning their loss under the lying Buddha. When you go through each cave you get lost in the mystery behind each painting, carving and cave itself. 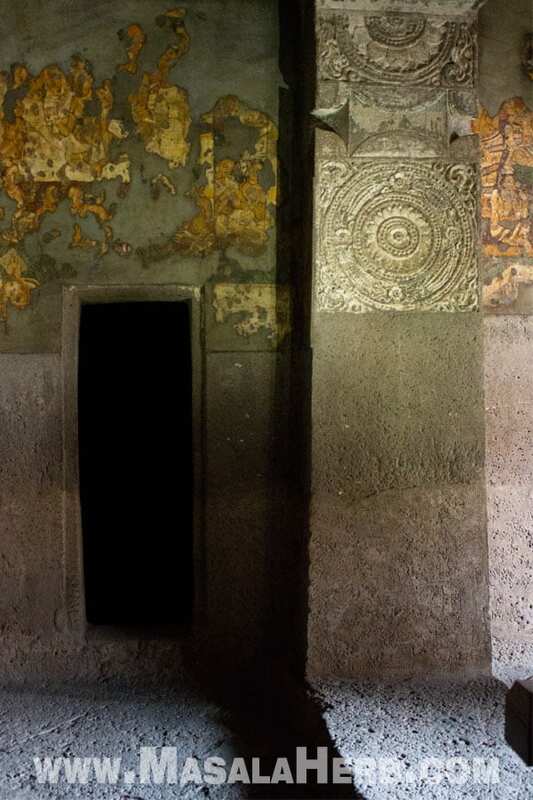 While the art pieces of another time are well preserved, it isn’t unknown that much has been restored and floor and wall holes have been filled with cement in recent times. Multiple waterfalls are coming to live during the heavy tropical Indian monsoon in the horse shoe shaped cave complex, where the caves are situated side by side in a height and with all the numerous visitors, the wall art paintings are in danger of slowly disappearing forever. You can’t use flash or light photography when taking a picture as this destroys the paintings!! Railings have been put in place in some caves so that visitors don’t go any further, yet you can still see the art very clearly. Each cave has a care taker, who makes sure that people don’t sit on statues and that no garbage littering takes place. Also some of them make sure to explain the caves a bit to the Indian visitors when they come loudly streaming into the caves with their big families, which is very helpful, as many Indians have no clue about their historical heritage and the significance of the caves. You need to remove your shoes before entering certain cave temples! (as it is common in India). You can’t take your shoes in your hand into the caves, so if you have expensive shoes, hire a care taker aka portier (more about this further below). The Ajanta Caves are open from 9 am to 5 pm and closed to visitors on Mondays, yet you are free to visit the caves during national holidays. with your own vehicle by following the MSH8 from Aurangabad to Ajanta. Once you arrive at the visitor point you can take a room at the only hotel there, or visit the newly build goverment Ajanta center for more information about the caves, or you proceed towards the caves. If you travel by car, there is plenty of parking once you reach the Ajanta caves visitor arrival spot. To reach the caves you will need to take a govermnent of Maharashtra bus, which passes by frequently. You can pick between AC (charged at 22 RS p/P) or non AC bus (charges at 16 RS p/P) and the drive takes a few minutes to the entry point towards the caves. There you will see the MTDC counter (Maharashtra Tourism Development Corporation). Plan in about 2-3 hours in average for your visit to the ajanta caves, it’s up to you which caves you want to visit or if you want to visit them all. You can hire a Portier at the entrance of Ajanta caves for 350 RS who will take you to the most important caves and he will carry your things safely around. Portiers are locals from the area and they wear an orange jacket from the archaeological survey of India. They are not guides but they will supply you with simple knowledge around the caves. 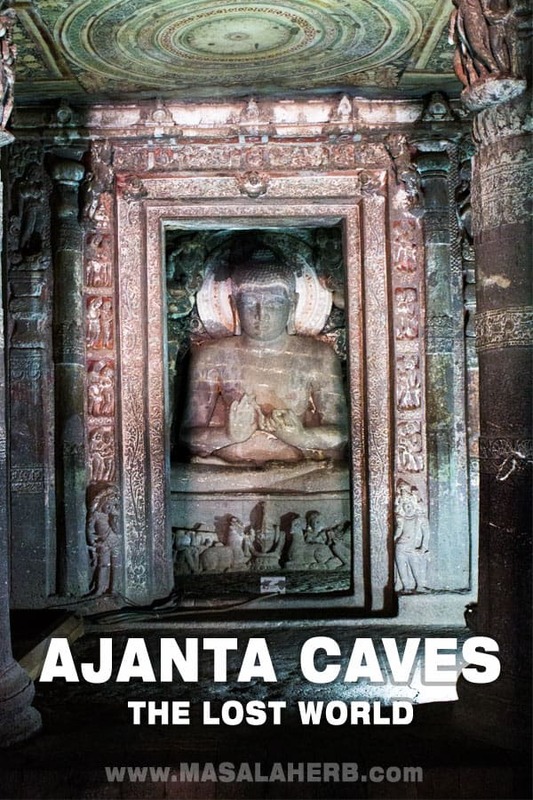 I also recommend getting a guide for the Ajanta caves, who has been approved by the state of Maharashtra. We saw them mostly right next to the first cave and they charge somewhere around 1200 RS or you can pick and inquire about a guide in your language, visit the website of the Maharashtra Tourism approved list of guides. Dear Reader, are you planning to visit the Ajanta caves soon? Don’t miss a recipe, Subscribe to the Masala Herb Newsletter! What an interesting post, great tips too, thank you! The caves sound like a very important part of Indian history, it’s great that they were rediscovered when they were; I hope they will be able to preserve them for future generations to enjoy. I hope that too. They are still restoring the caves and some are closed to public. WOW…these caves look amazing! What an incredible find and so lucky to be able see them. No, I won’t be visiting them any time soon :), so I do appreciate your sharing them! Really fun post! So interesting — learned a bunch I didn’t know. Love the pictures, too. Thanks! Your post brought back memories from school days. I first saw this mural of Lord Buddha in my History text book. Yet it is such a shame that despite living in Maharashtra for over eight years now, we haven’t visited this place. I have never heard about this place, but it looks truly spectacular. Also, the food looks so yummy! Wow! Hi, this may be interesting you: Ajanta Caves - The Lost World - Breathtaking Ancient Indian Paintings & Sculptures!